Did penicillin cause the AIDS pandemic? It was great to see this debate on the schedule, because such uncanny topics can draw discussion of disease aetiology out to considerations of factors that may escape the strictly biomedical paradigm. The debate came right after Dr. Carlos Cáceres (@CarlosFCaceresP) eloquently discussed Legal & Human Rights perspectives of HIV and STIs. Arguing that penicillin caused the AIDS pandemic Dr. Andrew Francis-Tan from Emory College of Arts and Sciences presented compelling data about the decline of Syphilis death rates and the increase in sexual behaviour after the availability of penicillin. Professor Jeffrey Klausner from the Department of Epidemiology, UCLA, offered a self-proclaimed reductionist argument against the idea that penicillin caused the AIDS pandemic. Perhaps the focus on a single causative agent draws attention from the social, economic and political conditions that foster the spread of infectious diseases. Francis-Tan was careful to state that he did not attribute the rise of AIDS simply to the collapse of Syphilis, but that multifarious factors were involved and that we need to take a holistic approach to any infectious disease necessitating human attention. Audience members were divided with half voting for and half voting against. 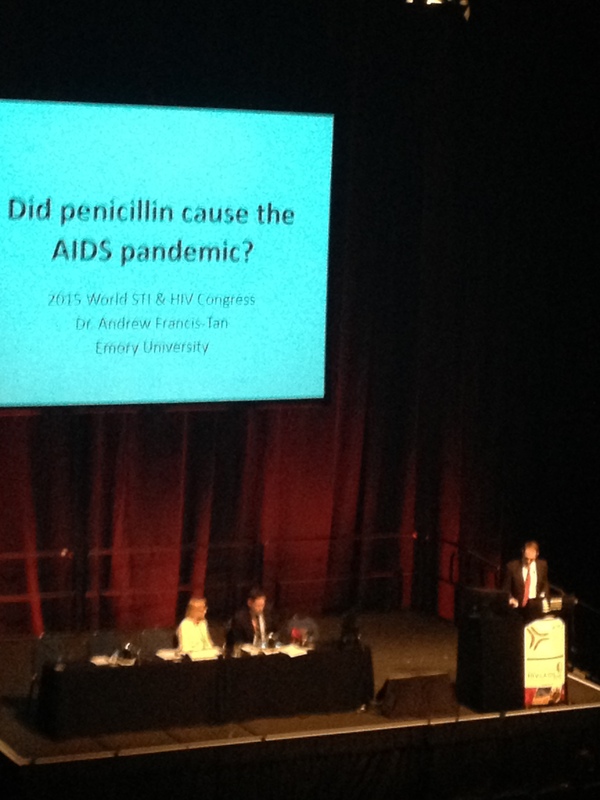 The debate was a lively way to end the World STI & HIV Congress. While scholars debated the role of penicillin in catalysing the spread of HIV, the opening plenary session to the Australasian HIV & AIDS conference was happening in an adjacent room with presentations by John Kaldor, Charles Chauvel, Robert Grant, and a panel discussion. HPV and HIV: new evidence on the infection risks and strategies to prevent HPV-related disease among HIV-infected people. Chaired by Hunter Handsfield & Anne Johnson, this session included talks by Cristyn Davies, William Miller, Hammad Ali, Iryna Zablotska, Tony Cunningham and Minh Duc Pham. 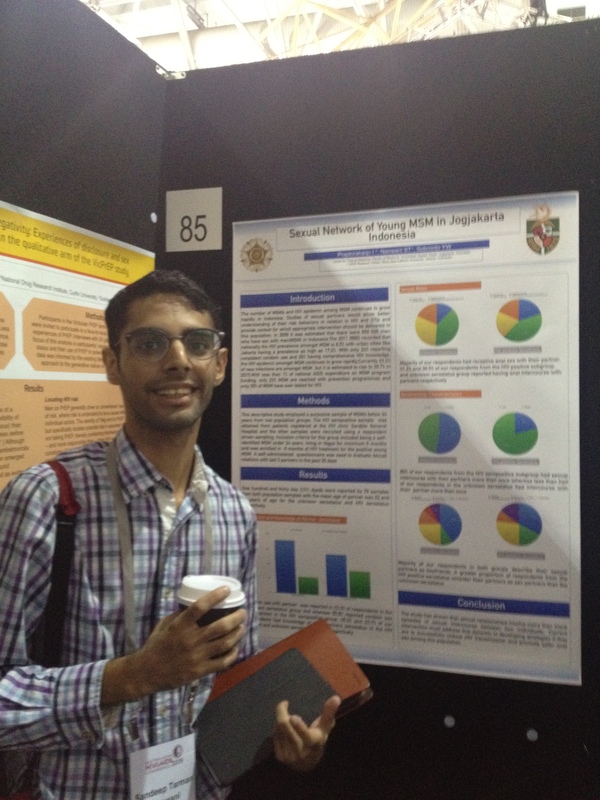 The World STI & HIV Congress Poster session continued and the Australasian HIV & AIDS Conference Poster session began. 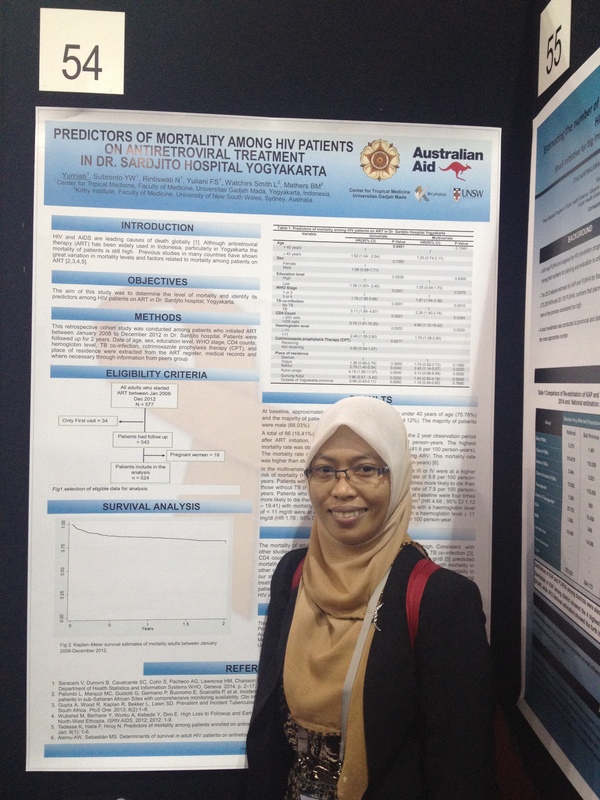 Pictured here are two researchers from Indonesia: Sandeep Nanwani (left) who presented a poster called “Sexual Networks of Young MSM in Jogjakarta, Indonesia” and Yurniati (right) who presented a poster called “Predictors of Mortality among HIV Patients on Antoretroviral Treatment in Dr Sardjito Hospital Yogyakarta“. Please also visit summaries of the World STI & HIV Congress Day 1, Day 2, and Day 3.